This is a collection of free small designs mainly in the form of "Hulls" files. The designs are immature in the sense that no prototypes have been built. So there is no detailed construction data nor any data on behaviour on the water. They, or some of them, will grow more mature with time. When I (or somebody else, please?) have time (and space ;-) to build prototypes. But no schedule promises! The original Lapuri ship was a smallish viking merchant ship a thousand years ago. It is now one of the dozen or so well known viking ship wreck finds that have been measured to detail. So this is not actually a design, but my attempt to transfer the known measurements to .hul file format. Just for fun. And to get reference data for the next section down below. If You are going to build a full size viking ship don't start off from this .hul file, there are much better sets of measurements on the web to start with. But this is something worth considering. This might well be my next sculling boat prototype project. Viking ship lines are pleasing to the eye, but a full size viking ship is... well.. impractical. So why not scale one down? Scaling a boat down (or up, for that matter) is not as straight forward as it sounds, however. The length and beam of the original Lapuri ship were about 40' x 10' (12 m x 3 m), and the crew might have been about 10 men strong. So one might think that scaling the original measurements down by a factor of two would yield a nice sculling boat for five. Sorry, that's not the case! Remember: if length is scaled down by 2, area will be scaled down by 4 and volume by 8. If the open area of the original ship provided space for 10, the scaled down boat offers the same space for 2.5 men. And if the original ship provided displacement (volume) to float 10 men, the scaled down version would float 1.25 men. That's a man and a baby! Yes, I know I'm cutting corners here! I should also take the boat weight into account. Ok, I don't accept cutting corners either, so let's do a more proper calculation. The full size replicas of the original ship are known to weigh about 1000 kg (2200 lbs). Ten men weigh about... say 900 kg (2000 lbs). In total 1900 kg (4200 lbs). That's the displacement of the original. Divide that by 8 to get the displacement of the scaled down boat at the same relative freeboard. What do we get? 240 kg (525 lbs). Enter a 90 kg (200 lbs) man, and You are left with 150 kg (325 lbs) for a 6 m x 1.5 m (20' x 5') hull. That's fine for the hull, but that's all. No provision for more crew members. The boat weight, surprisingly, didn't have a lot of effect on the result. I figure it's largely because viking ships are lightly built for their size. But a reasonable crew You would expect to cruise on a 20' boat would be at least three. So what can be done to make her float with two more men? Make her a bit deeper, a bit fuller in the ends. At the same time trying to keep the impression of the original lines, or the impression of "what makes a viking ship look like a viking ship". Surprisingly, or after a while of thought not at all surprisingly, the lines and the patterns of the strakes are close to original viking boats of the same size. For example the "Gokstad faering". After realizing this, I had to fight really hard against myself to resist the temptation to copy lines and ideas from the "Gokstad faering". Had I not been able to resist, the sheerline curve, viewed from the side, would have been flatter in the middle. And viewed from the top there would have been a straighter hull portion in the middle. But that would have been another thing. Not what I originally had in mind. So, instead of calling her a scaled down viking ship You can call her a full size "Lapuri faering"! The strakes can just be cut out of five sheets of plywood. Loft only once. Then jigsaw two sheets on top of each other. Lapuri faering hand plotting text file. The lapping of the strakes will be around 15 mm (5/8") in all cases, quite suitable for 1/4" ply. I've drawn the boat trying to copy the shape of the boats used in the Bangkog floating market. It should be very easy to build one out of two sheets of 1/4" ply, using basic taped chine construction methods. Sampan hand plotting text file. Some pictures from the thirties to start with. A boat beached on a track. There's a roller closest to the water. The run of the strakes on this boat is a bit strange. Broad and narrow. Maybe the boatbuilder wanted to create a special look, or just happened to have that kind of strakes at hand. Or maybe it just was his way of doing it. The backwards curving bow stem is typical to this boat type. The length is typically in the 17'-20' (5-6 m) range, beam 3'10"-5' (115-150 cm), and depth amidship 13 1/2"-15 1/2" (35-40 cm), with a length to beam ratio between 4 and 4.2. The number of strakes per side is usually 3-5, depending on how broad strakes have been available. Here's my plywood replication of the design. She's a bit on the short side, 16,8" x 4'2" x 15 1/2" (508 x 127 x 40 cm). Savo boat hand plotting text file. 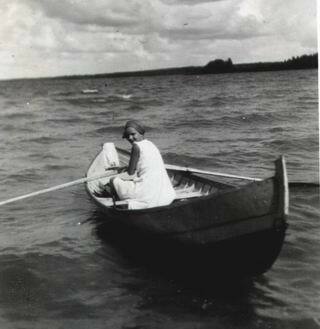 A fishing utility boat of the type used in the Finnish SW archipelago a hundred years ago. My version is a smallish one, suitable for sculling, sailing with a small sprit sail, or maybe an electric trolling outboard. Sea fishing boat .hul file. The length, about 15' (4.6 m), is selected for the ease of handling and plywood consumption. This type of boat varied a lot in the size, but basically with the same shape. She can just be squeezed out of four sheets of plywood. 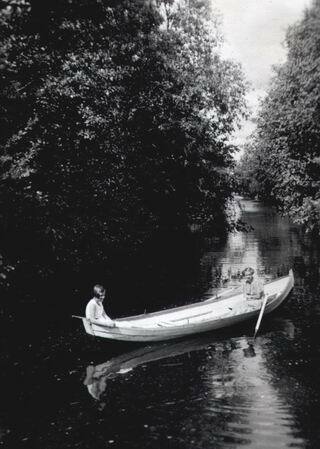 From the shape of the strakes it is easy to conclude that before the time of plywood a great deal of a boatbuilding project was carried out in the forest. Selecting suitable wood. The lapping of the strakes will be around 15 mm (5/8"), suitable for 1/4" ply. This is just a study of how a small, traditional pram dinghy, "a half of an egg shell", changes, when the number of starkes is decreased, one by one. But keeping the basic dimensions unchanged at the same time. I started off with seven strakes per side, plus a keel strake. You'll find all the corresponding .hul files zipped here. The first version with seven strakes is close to a traditional pram dinghy, built lapstrake out of "real wood" strakes. Going to six strakes doesn't change her much. But five strakes per side might be a nice one to build lapstrake out of plywood strakes. The strakes are probably too wide, around 6" (15 cm), to build out of real wood. But at the same time narrow enough to keep the traditional lapstrake appearance. The same applies to the four strake version. The three strake version may be a loser. Her looks may not be worth the building trouble. The same probably applies to the two strake version with a keel strake. But remove the keel strake, and what do You get? 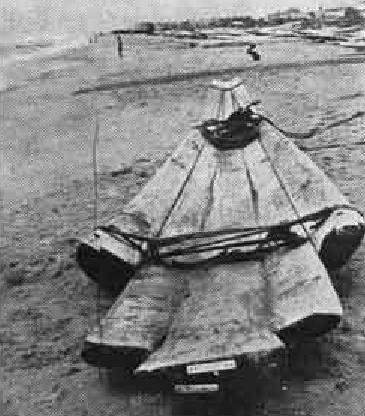 A typical plywood dinghy, a D4, for instance. Go yet one step further, and You are left with a very basic flat bottomed plywood dinghy. All the dinghies in to World are the same! The original Gokstad faering was built by the Norwegian Vikings more than a thousand years ago. She was unearthed year 1880 in Standefjorde with the big Gokstad ship, which was dated to year 850. 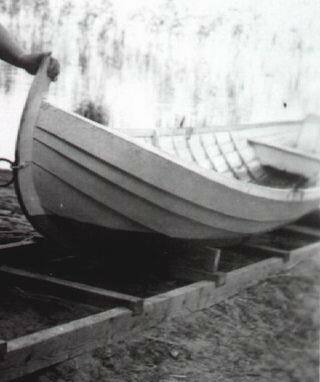 In 1958 Arne Emil Christensen made measurements and documented the boat. My humble .hul interpretation is based on Christensen's drawing. But why just half the boat? 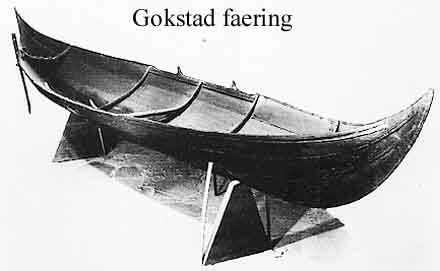 The Gokstad faering is curved in such a way, that it is impossible to produce a faithful representation of the complete boat with "Hulls". The steep sheerline upwards curvature in the bow and stern starts very close to the boat ends. Also, the plan view of the boat includes a rather straight mid section, turning to convex, and finally concave closer to the ends. Simply impossible to implement with only three frames, as in "Hulls". But the boat is almost perfectly symmetric. There is no great mistake in drawing just one half, and building two similar halves. An interesting detail to note, when playing with the Gokstad faering .hul file, is the prismatic coefficient. With low displacement it starts from 0.63. Increase displacement slightly, and the prismatic coefficient drops to 0.6 and stays there for all displacements until the boat floods. And note, the .hul file lacks the stem. The stem would add a couple of inches to the waterline length of the boat, dropping the prismatic coefficient very close to the 0.589 of the Sears-Haack body, discussed to a greater detail in the 10 1/2 ft Skiff section. A quick conclusion could be, that this over a thousand years old design probably behaves very nicely, and very optimally, at any amount of load. What's the use of designing anything new today? The Tamil word "Kattumaram" means "logs tied together". The original Kattumaram boat of the Bay of Bengal fishermen were and are actually just that. The logs are shaped in such a way, that once tied together, they create a boat formed raft. My .hul interpretation is based on the drawing presented in FAO BOBP Report 17. As You can see above, the original drawing is slightly "artistic", the bow lines don't match in the different views. I've corrected the bow so the contruction is possible in real world.